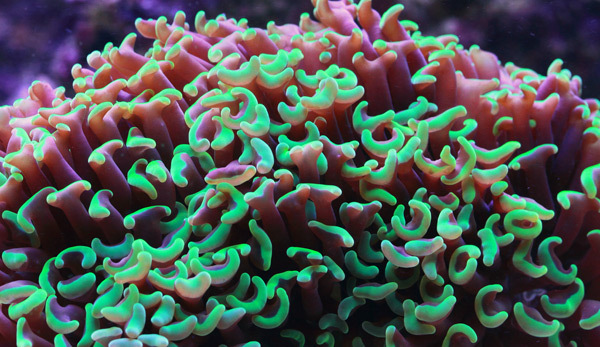 The Hammer Coral is a large polyp stony (LPS) coral. Its polyps are visible throughout the day and night and do to its long waving tentacles, beginners and lay people often think it is an anemone. Common colors are green, tan, or brown but many ultras are available with other colors and combinations of colors. Varieties harvested in Australia are generally more spectacular with tentacles that glow under actinic lighting. The aquarium housing this coral needs to have proper water parameters for it to thrive. It does best with moderate lighting and moderate water movement. Place Hammer four to six inches from other coral to keep its long sweeper tentacles from stinging them. For best growth feed weekly with micro-plankton and/or mysis or brine shrimp.